This week I am featuring art prints from my Floral/Still Life Collection. The collection includes a number of prints done in a variety of watercolor and oil techniques to create a range of different looks. 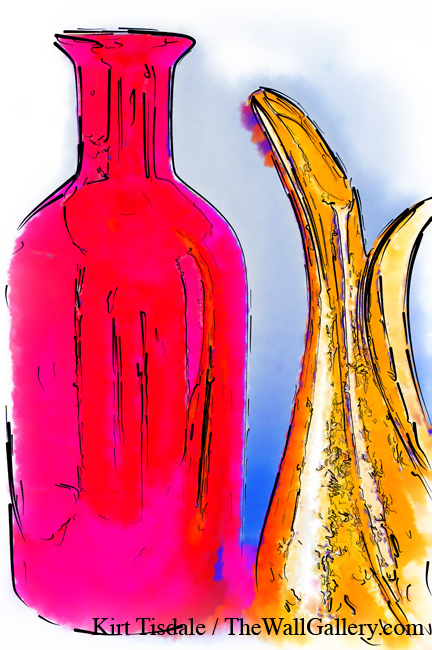 I’m starting the week with a still life art print titled: “Simplicity in Red and Gold”. It’s a print of a red vase and a gold pitcher. Simple enough. I combined these two elements using an abstract watercolor technique that focuses on drawing simple lines and using bold colors. The inspiration behind the objects came from a red glass vase we have and the gold pitcher is based on a ceramic piece my mom did 50 plus years ago. I grew up seeing it displayed in our house. When my mom passed away, I asked for this piece to keep it setting around in our house for my kids to enjoy and appreciate something their grandmother had made. Using this type of technique and the subject matter created a very clean and contemporary art print. The drawn lines create the shapes and the bright colors pull your eye into the scene. I created it with a modern contemporary décor in mind, but in actuality depending on how the print is matted and framed really dictates the type of interior design this print compliments. Thoughts? I invite you to come into the gallery to view the collection in Floral/Still Life. This entry was posted in Abstract Watercolors, Art Prints and tagged abstract art prints, artist kirt tisdale, contemporary artist, interior design, online art gallery, still life, watercolor, watercolor art on September 29, 2014 by Kirt D Tisdale. The final featured art print for the week from my Landscape Watercolor Collection is “Red Rock Cactus”. It jumps right out there with a bold colorful look. The setting is near Phoenix with the many red rock outcroppings prominent in the Phoenix and Scottsdale area. A prominent saguaro cactus and two smaller ones frame the scene. The print has a typical American Southwest look, but I wanted a little more of a punch. The technique I used is more of an abstract approach creating a bold modern look. I started by outlining the detail of the scene and then filled in using abstract shapes of color. This technique keeps the intricate detail of the foreground, cactus and rocks, but adds simple bold shapes of blue to create a sky effect. 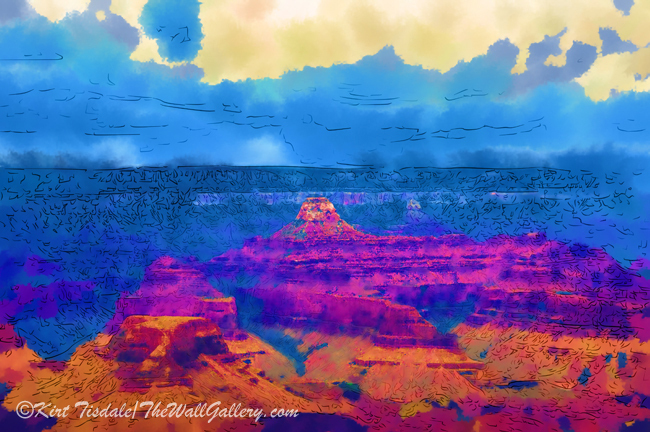 The simplicity and colors of the blue creates drama in the print and accents the strong red of the rock outcropping. 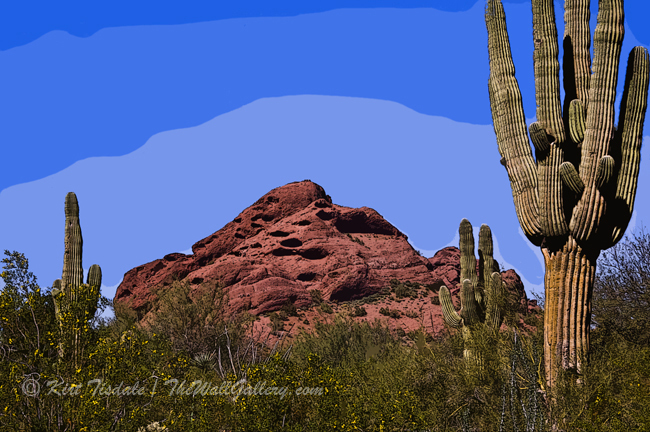 Your eye is drawn to the red rock which has more detail than the sky, but less than the cactus and foreground. Moving into those elements, the detail and softer colors of green finish the framing of the central subject, the red rocks. If you really drilled down into the color pattern of the cactus and foreground, you would actually see the same color shapes, but the drawing of detail keeps the shapes confined within distinct borders. I loved the setting of the scene and wanted to present something that had a bolder more contemporary look to it. Thoughts? I invite you to come into the gallery to view the collection in Landscape Watercolor. 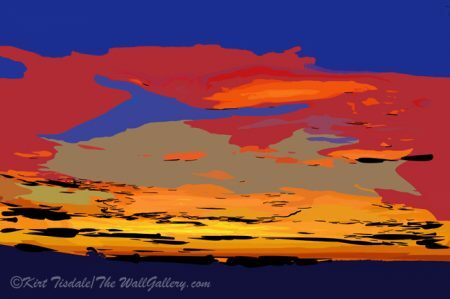 This entry was posted in Abstract Watercolors, Art Prints and tagged abstract art prints, arizona, artist, artist kirt tisdale, cactus, desert, interior design, online art gallery, saguaro, watercolor landscapes on September 26, 2014 by Kirt D Tisdale. 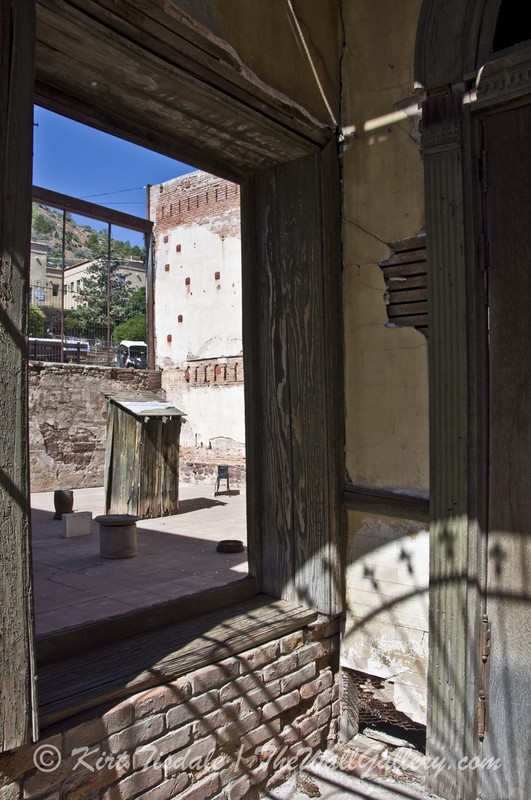 In continuing my theme from last week about coming across the unexpected photography opportunities in Jerome, Arizona, I have attached 7 shots from that same day. The classic car in a basement was truly unexpected, but it just kept getting better…..
Further down main street from the above mentioned car, I came across a vacant building. 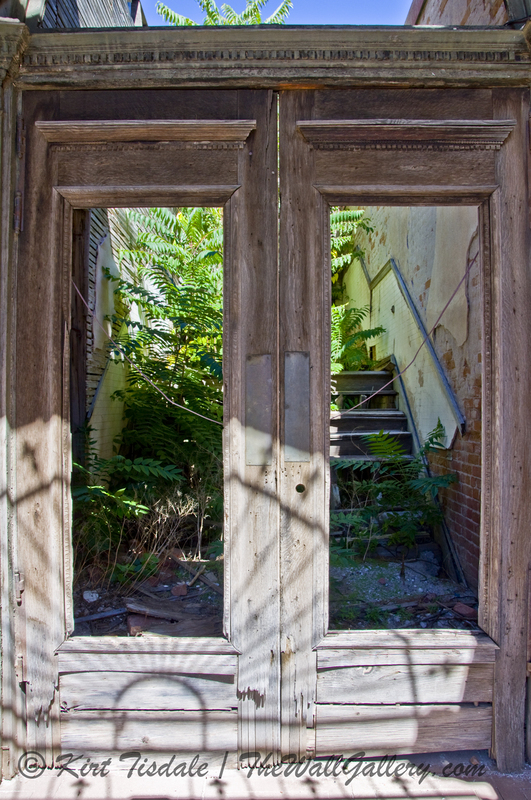 This wasn’t just any vacant building, but one that was open to viewing through large windows that were no longer there and doors with gates. The building was on the corner and the sidewalk wrapped around the front and descended down the side of the building towards the street below. Along the side of the building was a series of doorways going into what use to be establishments that were in the building. This was taken from the main level in the front on Main Street looking down over what looked like it use to be a ballroom. You can see the side street as it goes down the hill. Focus on the interior window in the left of the frame. The next shot is from down there in front of the gate across the entry. The window I just mentioned is on the wall to the left, you can just make out the framing. This is the first of three-arched entries on the side of the building. This one obviously use to be a saloon. 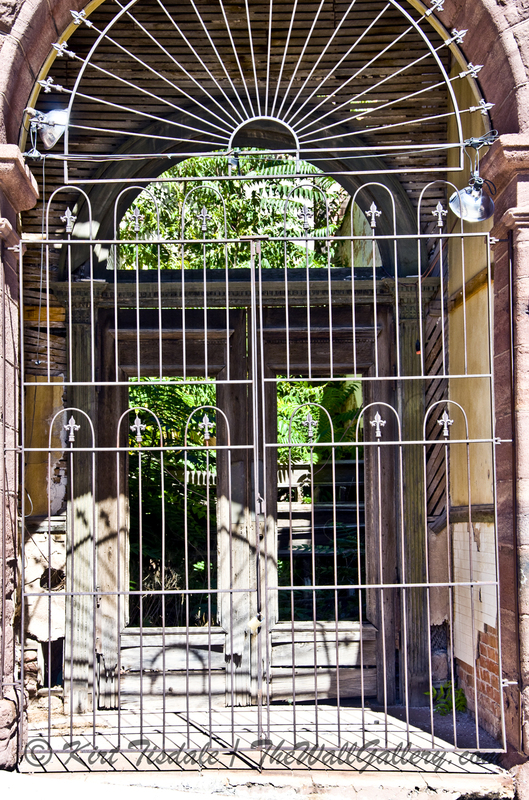 Same location, but with my camera lens between the wrought iron bars of the gate. This is the next entry down. 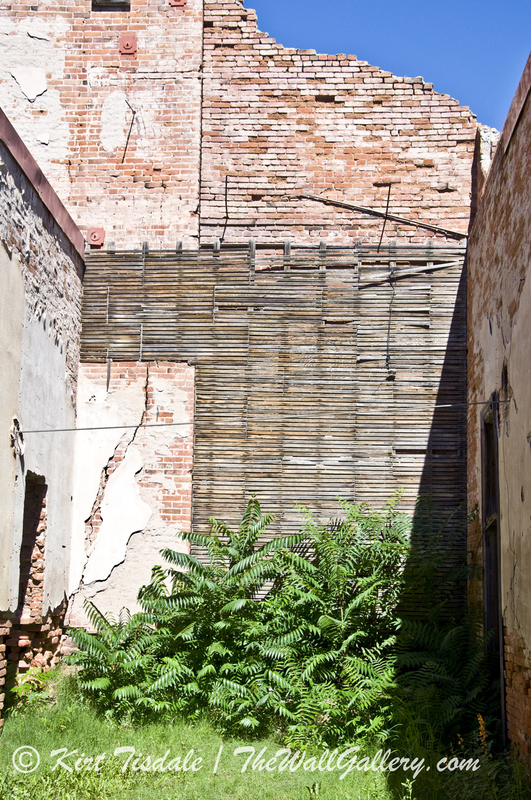 Looks unusual to see greenery growing in what use to be the interior of the building. This is the third entry where there isn’t a door, just plant life. 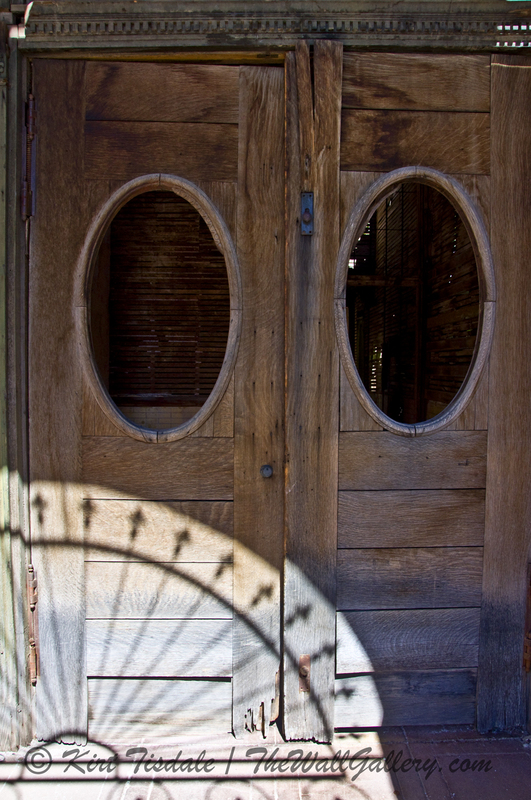 Again, I took this shot by sticking my lens through the wrought iron gate that was in the exterior archway. So, when you come across the unexpected, takes tons of shots because you will want to figure out what you want to capture and from what angle to tell a story. In a case like this there are so many interesting elements with this old historic structure that has been gutted and cleaned up. From this series, my personal favorites are the last and the first one in that order. Both present interesting elements from architecture to lighting and then both have a strong sense of depth. Thoughts? 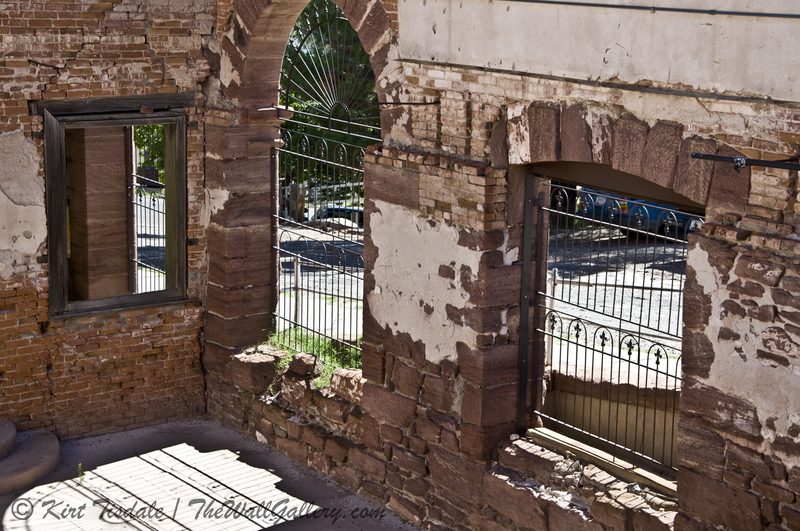 This entry was posted in Color Photography, Photography and tagged arizona, art galleries, historic, interior design, jerome arizona, kirt tisdale, mining towns, online art gallery, photographer on September 24, 2014 by Kirt D Tisdale. Last week, I featured two new prints from my Landscape Oil Collection. This week I am going to take a look at two very different prints from my Landscape Watercolor Collection. In this particular collection, I have used a variety of watercolor techniques to create totally different looks to landscape scenes. The first print I wanted to feature is “ Barn in the Valley”. The setting is rural Iowa in wintertime. There isn’t any snow on the ground, just barren trees and brown dormant fields. Even in this type of setting, there is beauty in my opinion. This time of year is a time of rest and regrouping for not only the plant life, but also the farmers that grow the crops. I love the way the barn sits in a small valley surrounded by rolling hills. In this particular print I used a pointillism style for the technique. Pointillism is a style of painting in small distinct dots of color that are applied in a pattern to form an image. The technique was developed in 1886 branching from impressionism. The style creates a very soft look to a scene and the eye combines the dots into a recognizable pattern. In playing with this technique, I find that it either works really well or really poorly and I haven’t seen much in between. I liked it for this scene to keep a soft; warm and casual look to this particular setting. It allows the barn to become center stage without over powering the entire print. Using warm earth tones keeps the scene subtle, yet inviting. Thoughts? 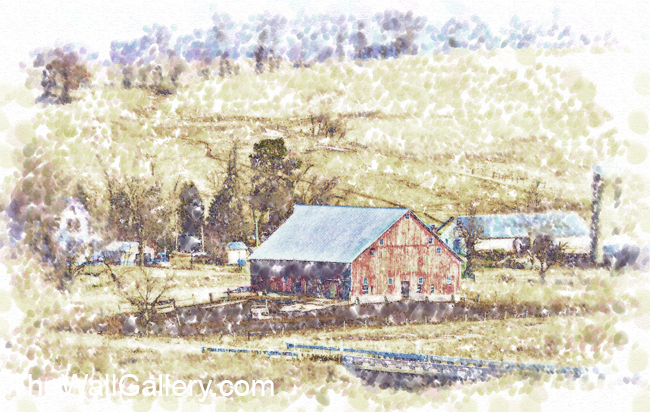 This entry was posted in Art Prints, Landscapes: Watercolor and tagged artist kirt tisdale, barn, farm, farming, interior design, Iowa, online art gallery, rural, watercolor art, watercolor landscapes on September 22, 2014 by Kirt D Tisdale. Fall is just around the corner and here I am pushing winter….my apologies to anyone who isn’t ready for that thought yet. I just added this art print to my Landscape Oil Collection and wanted to feature it. 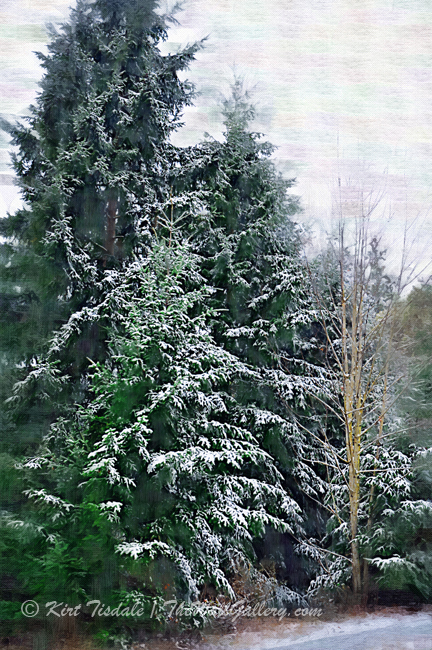 I titled it “Snow Covered Pine”. For this print I chose a simple oil technique to create a soft and comfortable look. To add a subtle element of contrast, we have the deciduous tree on the right of the frame and a hint of a pathway or road in the lower right hand corner. I also used a hint of pastel color to create texture to a cloudy sky, just enough to make it interesting, but not distracting. For anyone that has been around a snow covered pine forest, I am trying to evoke the feeling that is experienced in such a situation. There is stillness in the air and nature seems to be at peace with itself and we seem more as one with nature. In this calming and tranquil effect there is an inner peace that comes through. Can you visualize yourself in that setting? I love those moments. Thoughts? I invite you to come into the gallery to view the collection in Landscape Oil. This entry was posted in Art, Art Prints, Landscapes: Oil and tagged artist kirt tisdale, forest, interior design, online art gallery, pine trees, snow, snow covered trees, winter on September 19, 2014 by Kirt D Tisdale. I wanted to share two shots I took of a classic car. I say classic, because it sure looks classic. I have no idea what type and year this car is, but it looks great and makes for great photography. The real story of these shots is where they were taken and how I happened to come across the opportunity. A couple of weekends ago, my wife and I took a quick road trip to the northern part of Arizona to get out of the desert heat. One of our stops was an old mining town called Jerome. What makes Jerome unique is the topography in where this town was built. It is literally on the side of a mountain with Main Street looping itself back and forth in switchbacks. Imagine the elevation change between the blocks of buildings. No matter which street you are on, you are looking over the top of the buildings of the street below you. 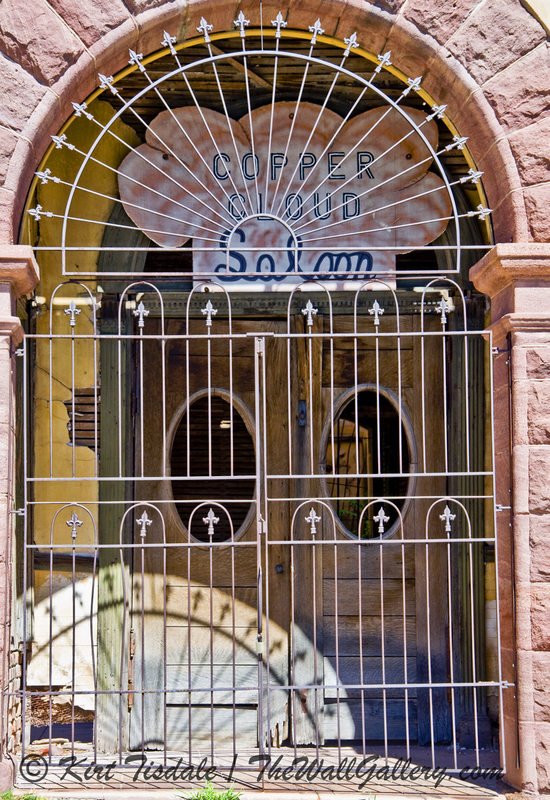 It truly is a photographers dream place, because of all of the interesting historic paraphernalia throughout town from the buildings themselves to old mining cars, etc. We stopped and started exploring. I came across a steep staircase along the side of one of the buildings that led to a deck overlook of the valley floor below. Once I got down to the deck, I saw a door that led into what would have been a basement two stories below the street level with large windows and more viewing areas to the valley below. 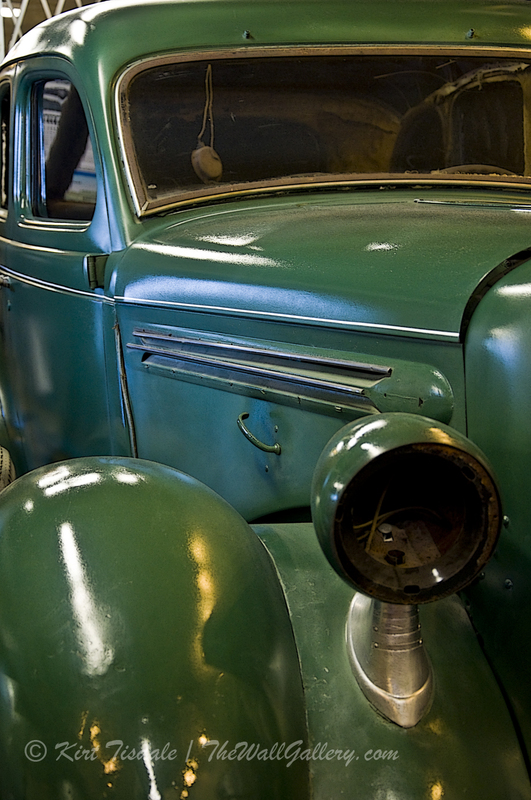 Imagine my surprise to find a couple of little shops, an artist studio and this classic car in this lower level. I have no idea what the purpose or point was, but loved the look of the car and snapped off a few shots. At the time, I was thinking these will make great black and white prints, so I tried a number of different angles. The two I have attached are my favorite. I did convert them to black and white, but realized that the high gloss and the strong reflective glare from ceiling lights really looked good in the original color shot. Thoughts? More unique shots from Jerome coming next week! 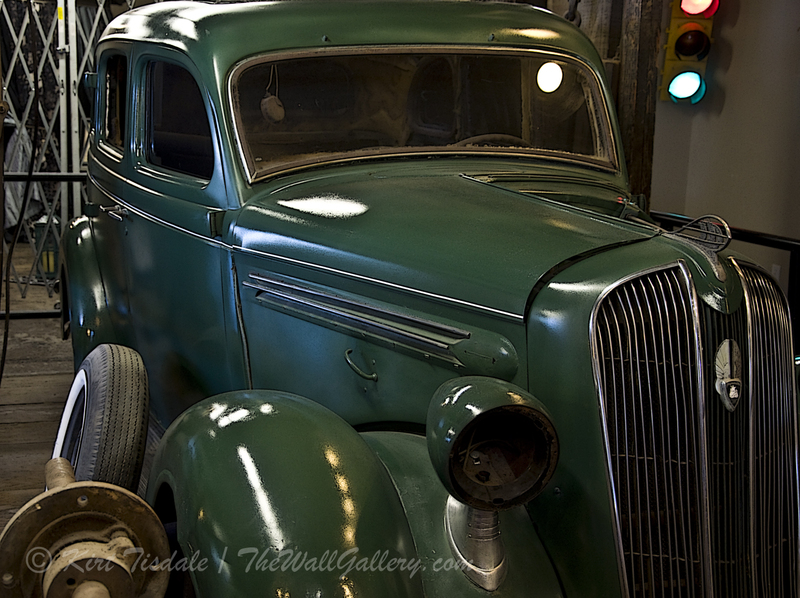 This entry was posted in Color Photography and tagged arizona, classic cars, interior design, jerome arizona, kirt tisdale, online art gallery, photographer, photography on September 17, 2014 by Kirt D Tisdale. I don’t think its any secret that I love the beauty of nature. I love to experience it, hike in it and look at it. Most of my inspirations come from my venturing out and looking at the beauty around us and trying to capture it. The art print I am featuring today celebrates just such subtle beauty. I chose “ Birch Trees in the Woods” from my Landscape Oil Collection. This particular art print is from one of my many hikes last year in the Issaquah area of Washington. Issaquah is now an eastern suburb of Seattle, but started as a town located in the foothills of the mountains far away from the big city of Seattle. It has kept most of its rustic charm and preserved the natural beauty around it with all of the forest-covered foothills. There are an abundance of hiking trails and paths throughout this area. This particular scene caught my eye on one of my hikes. It was about this same time last year with summer winding down and the thought of fall starting soon. The days were warm, not hot, and just perfect for hiking. Having lived in Colorado a number of years, I am partial to aspen trees. I love the white bark and this grove reminded me of them. Most of the forest in this area is heavy with pine trees and just interspersed with deciduous trees, so coming across this type of a grove was a visual treat. To create this art print, I used an impasto oil technique. This type of style creates bolder brush strokes and stays with primary colors creating a textured and vivid scene that adds a strong element of depth. Looking at this print, I am not only ready to start hiking, but I can still see the wind gently swaying the trees and hear the leaves rustling. Thoughts? 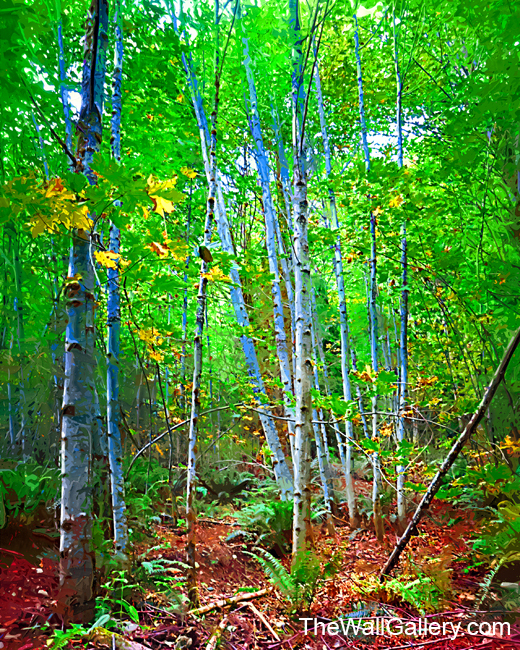 This entry was posted in Art Prints, Landscapes: Oil and tagged artist kirt tisdale, birch trees, forest, hiking, interior design, issaquah washington, landscapes, oil painting, online art gallery on September 15, 2014 by Kirt D Tisdale.